So I got to see the Specials in Leeds this may 24th. It was definitely a trip. I was sitting on a corner of the stage watching the band (minus Jerry Dammers). They came on the stage suddenly. John Bradbury did the opening drum fill of “Do the Dog” and they were off. They were launched into it like it was 1979. They seemed a little bit older but surprising well preserved. They mostly played the first album and the first half of the 2nd album. plus a couple songs off their eps. The Specials have confirmed their 2010 plans for a North American tour, with stops in L.A., Toronto, NYC and Coachella. In fact, the Terminal 5 show on April 21st is already sold out. Luckily, they’ve added another show at the same venue one night earlier, on April 20th. Tickets go on AmEx presale Wednesday, February 17th at noon. General sale starts the Friday at noon.They’ll also be appearing on April 13th on Late Night with Jimmy Fallon. All dates are below. 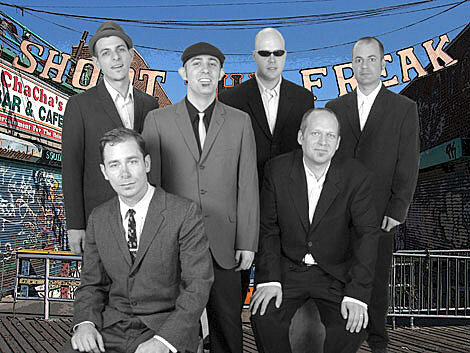 The Slackers opened for the Specials when they played the UK last spring. While the Specials have a new live DVD on the way, the Slackers are prepping the releasing of their new album, The Great Rocksteady Swindle, set to come out April 20th on Hellcat. It’ll be their first album on the label in four years. Recent releases, including 2009’s well-done b-sides and versions comp Lost & Found, have been on their own labels – Indication, Special Potato and the online label Whatevski. The latter recently put out an NYC Taper-recorded bootleg of the band’s pair of holiday gigs at Knitting Factory last December. When one of the opening bands didn’t make it through the blizzard that hit on the second night, the Slackers stretched into two sets with songs from all seven of their studio records. The band’s tour plans include shows in Japan, the West Coast and Europe. Those lead up to a hometown record release show on June 4th at Highline Ballroom. Tickets go on sale at noon.